A Chinese frozen-food producer has been hit by African swine fever. 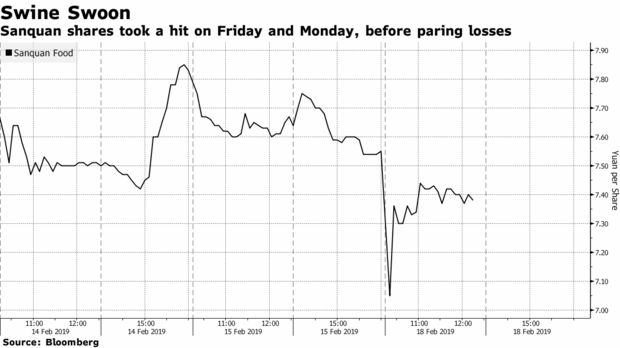 Sanquan Food Co., based in Henan province, slumped the most since October after a media report said African swine fever was found in some of the company’s pork dumplings. Volume in the first hour of trading Monday was quadruple the three-month full-day average, according to Bloomberg data. China is trying to contain the spread of African swine fever, which is threatening its massive pig population. The virus, which isn’t known to harm humans, was first reported in August. At least 24 provinces in the world’s top pork producer have disclosed outbreaks as of January. Sanquan acknowledged the media report and said it was cooperating with the government, according to a statement to the Shenzhen Stock Exchange. The development follows an announcement last month from Fu Jian Anjoy Foods Co., which said some meat products tested positive for the virus. Sanquan shares dropped as much as 7.2 percent, before paring declines to 1.6 percent as of 10:50 a.m. in Shenzhen. The Shenzhen Composite Index climbed as much as 2.6 percent. Pig farmers that haven’t reported the virus continued a rally that began last week. The companies led the best week in more than three years for China’s agriculture stocks on speculation pork prices will be rising due to limited healthy pig supply, as China culled more suspected pigs. Chuying Agro-Pastoral Group Co. and Muyuan Foodstuff Co. surged more than 5.6 percent in early Monday trading. Fu Jian rose as much as 1.7 percent.